The Finance Office ensures that all funds, both appropriated and earned, are properly and completely accounted for and that internal controls minimize opportunities for fraud, waste, and abuse and thus provide accountability to OMB, Congress and the American public. The director is responsible for providing an integrated system of records and reports to meet management’s data needs and ensure compliance with applicable laws, rules, and regulations. Bio: Prasad Kotiswaran is the Director of Finance at the Federal Mediation and Conciliation Service (FMCS). In this role he oversees the financial operations of the agency. This includes the entire accounting functional activities and the office is responsible for obtaining a clean audit opinion from the auditors. 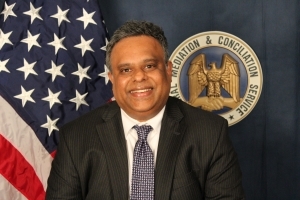 Prasad joined FMCS in September 2014 as the Director of Finance. As the director, he has provided expertise and oversight in the compliance of laws and regulations under which FMCS operates. His overall focus is to provide enhanced transparent internal controls over the financial accounting operations and the financial statements that FMCS issues to obtain a clean audit opinion. Most notable among his accomplishments at FMCS include the preparation of the annual operating plan and submissions to Treasury on the government wide treasury account symbol adjusted trial balances. Prior to joining FMCS, Prasad was Staff Accountant, CFO, at the Internal Revenue Service. He worked on several IT, cost accounting and financial reporting projects during his seven years there. Before moving to the Washington DC area, Prasad worked in the private sector within the financial services industry holding several staff positions. He has taught undergraduate accounting courses at Strayer and University of Phoenix. He currently teaches online undergraduate accounting courses at Southern New Hampshire University.